Certain things happen only in Darjeeling and political bosses from the plains seem to be oblivious to them. Surjya Kant Mishra, the CPM state secretary and leader of opposition in the Assembly, addressed the media in the party's local committee office at Judge Bazar in Darjeeling today. Walk down a few steps and on the floor below, things were as usual in the office of Trinamul (hills). In the rest of Bengal, such bonhomie between the CPM and Trinamul is unheard of. In fact, what is frequently heard is the ruling party's forceful occupation of the weaker lot, which has been the CPM for some years. The CPM had set up its office in the unfinished four-storied building in 1998 when the party was in power. It was Trinamul's turn to move to the same structure in 2014. For the past three years, cadres of both Trinamul and the CPM have been working from their respective offices amicably. Told about the strange bond between the two parties in Darjeeling, Mishra said: "I do not know about the office. I have come here for the first time. I do not know what is above and below. The local leaders can talk about it. In this world, everyone can stay together, the CPM, TMC, Left, and the BJP." This is not the end of the bonhomie story. Today, the CPM held its district committee meeting in Darjeeling at the Gorkha Dukha Niwarak Sammelan Hall, about 500m from the party office. On the same floor, in another room, Trinamul's trade union leaders were also holding a meeting. "One or two CPM leaders were confused about the venue and accidentally landed at the Trinamul meeting," said a source. Not just the hill Trinamul and CPM leaders, but even the cadres seem to be not bothered about the rivals sharing the same building. "Our party activities are a bit less these days but sharing the same space has not been a problem. There has been no untoward incident till date," said a CPM worker. Administrative sources had earlier said the industries department had asked the public works department to construct the four-storied building at Judge Bazar in the 1980s. 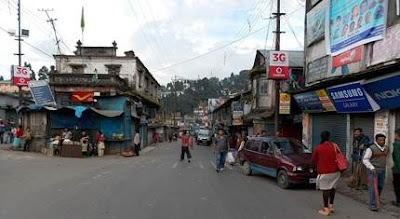 But the construction could not be completed as the Gorkhaland agitation began in 1986. The industries department used to run a goods ropeway service from the compound of the building to Bijanbari, Darjeeling. The service was discontinued in 1998. A portion of the compound has also been encroached on by people who opened shops then. Local PWD officials are now not sure of the status of the building.